Sanctuary creates an experimental space in the heart of the Dark Skies Park for new work that ranges from digital and sound works to radio transmissions, video and performance. The event brings together artists and members of the public with a special interest in place and creative experimentation in light and sound, landscape and environment. The project grew out of a Wide Open artists residency in the Dark Skies Park (2012/13) that was developed with Forestry Commission Scotland and Creative Scotland. During the residency, artists Robbie Coleman and Jo Hodges explored the human relationship with darkness through performance, installation and sound and with sound artist Stuart Mclean (Frenchbloke), created the Dark Outside FM event which, supported by Wide Open and The Forestry Commission, has developed into Sanctuary. The Dark Outside FM is a hyper local 24 hour radio broadcast of previously unheard sound which can only be heard by travelling to the site with a radio, there is no streaming or recording and all files are deleted after being played. The Dark Outside FM explores a new way of working in a remote area with digital contributions from artists from all over the world. 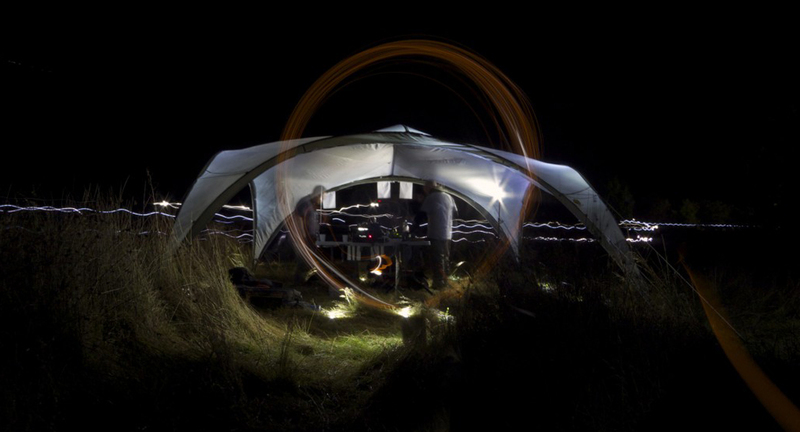 In 2013 The Dark Outside FM was supported as part of Environmental Art Festival Scotland. 300 people attended the event with developments including the Dark Star Lounge including a presentation by Scotland’s Astronomer Royal Prof. John Brown. The following year under the name of Sanctuary 2014 – Exploring the Unseen and In-between, The Dark Outside FM was brought together with the Dark Star Lounge and The Dark Outside Lecture, and a number of visually spectacular installations, digital projections and performance. Sanctuary 2014 attracted an audience that camped in the hills and artists who contributed by bringing their own experimental work with them. 500 people came to experience the event and 193 artists worldwide contributed new digital works to The Dark Outside FM. In addition there was a 100ft neon installation, open workshops manipulating the original broadcast in real time (Broken 20), live transmissions (DROKK, Zoviet* France, FiniTribe) and large scale interactive video projections (Unicorn Diagram). 1000 people came to Sanctuary 2015 which continued to explore light and dark in new ways, linking The International Year of Light to The Dark Skies Park.